A Basman court in Moscow on May 7th sentenced Oborona Coordinator Oleg Kozlovsky to 13 days of administrative arrest. As reported by the press service of the Other Russia coalition, Kozlovsky, who considers the decision illegal, has declared a hunger strike. According to Other Russia, Kozlovsky’s trial was fraught with procedural irregularities: Court documents appeared to allege that Kozlovsky had been in two different places at the same time and had been detained by two different police officers. The trial judge, however, stated that “it has nothing to do with the case.” All the defense witnesses were removed from the courtroom. Kozlovsky is to regain his freedom the day after the conclusion of the first meeting of the opposition coalition’s National Assembly, a shadow parliament organization. Kozlovsky was one of the organizers of the Assembly, so his colleagues do not doubt that his arrest and sentencing have been calculated to prevent Kozlovsky participation in the Assembly. Another Oborona member, Ivan Afonin, who was arrested with Kozlovsky and received a six-day sentence, also announced a hunger strike. Earlier the court had handed out similar sentences to journalist Alexander Weinstein, journalist and activist Maxim Polyakov and Oborona member Vladimir Akimenkov. May 8th was my birthday! A jolly gift I received from the Kremlin! If you click here, you will see a photograph taken of the outside of my prison, where my comrades gathered to celebrate the occasion, unfortunately in my absence. 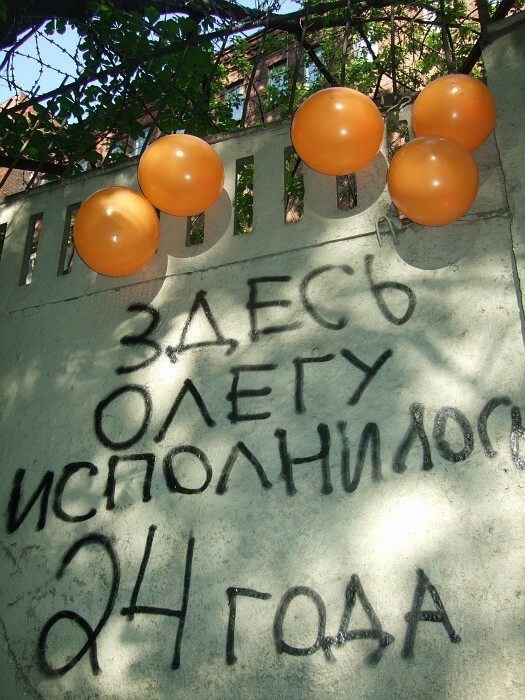 They decorated it with orange balloons — the color of revolution in Eastern Europe — and spray-painted the message “here Oleg Kozlovsky completed his 24th year of life” on the wall. Then they drank a toast to my health. The Oborona blog explains that I was preemptively arrested by plainclothes police on May 6th while not engaged in any form of protest activity. When I was removed from court after the sentencing, my comrades, surrounded by OMON officers, chanted: “FREE OLEG KOZLOVSKY.” This is not the first time the chant has been heard in Moscow’s streets and elsewhere. Likely, it will not be the last. Try as they will, my foes cannot silence the voice of freedom. It will be heard.